NAB Cup. Join the real fans. New Docker draftee Darcy Tucker had an encouraging first up performance, finishing the match with 21 disposals at 67 per cent efficiency and eight marks, including an equal gamehigh 19 disposals in the defensive half of the ground. In a lowforward 50 entry game, the Dockers won the inside 50 count 39 to 38 for the match, but were far more efficient generating double the amount of scoring shots from these entries. Matureaged recruit Adam Marcon was arguably Richmond's best performed debutant, finishing the match with 12 disposals at 83 per cent efficiency, six contested possessions, five tackles and a goal. 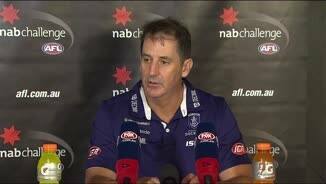 In what will be his 17th season of AFL football, the Dockers would be encouraged by the form of Matthew Pavlich. The former Dockers skipper has compiled 18 disposals, 10 marks and four goals for the match. In just 40 minutes of game time, Nathan Fyfe has amassed 17 disposals, with an equalmatch-high 11 of them coming via a contested possession. He has also won five clearances, only Lachie Neale with six has had more. As has been the story for the entire match, Fremantle continues to own the football in the last quarter, leading the disposal count 65 to 28 and uncontested possessions 51 to 18 for the quarter. Richmond InterchangeKane Lambert replaces Jacob Townsend due to the blood rule. Garrick Ibbotson has been fantastic for the Dockers with 18 disposals, 10 coming via an intercept possession, double of any other Docker on the ground. Michael Barlow has been workmanlike again for the Dockers, leading the team in disposals with 24, contested possessions with 10 and tackles with seven. 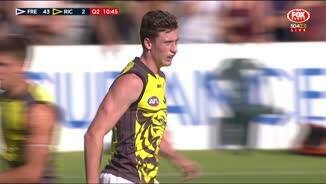 He has also had four clearances and kicked a goal. Kicking with the breeze in the first and third quarters, the Dockers have won the disposal count by 67, uncontested possessions by 60, marks by 39 and have used the ball at 71 per cent efficiency by foot compared to Richmond's 60 per cent. Fremantle has outscored Richmond 5.1.31 to 0.3.3 from chains launched by an intercept possession. Richmond InterchangeDavid Astbury off due to an injury. Richmond InterchangeBen Griffiths off due to an injury. Fremantle leads Richmond in uncontested possession by 49 for the match. Last season the Dockers averaged 12 more uncontested possessions per game than their opposition, ranked sixth in the competition. Nathan Fyfe has already won five contested possessions in his first seven minutes of AFL football for season 2016. Only six players for both sides combined have had more than five contested possessions for the entire match. At the half, Fremantle has used the ball better in the blustery conditions, kicking at an efficiency of 67 per cent compared to Richmond's 58 per cent. Forward of centre the Dockers have gone at 62 per cent by foot, compared to the Tigers' 52 per cent. Aaron Sandilands has helped Fremantle to an advantage of 32 to nine in the hitouts, winning 18 hit-outs to one against Ben Griffiths. The Dockers have outscored Richmond 4.0.24 to 3.1.19 from stoppages, despite the Tigers leading clearances 17 to 16. All three of Richmond's goals have come from stoppages. last season the Tigers averaged 33 points per game from stoppage chains, ranked 10th in the competition. 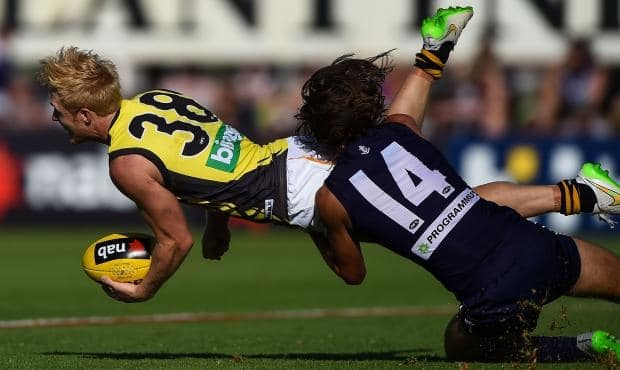 Richmond has had the last seven inside 50s of the match and nine of the last ten forward 50 entries, kicking 3.2.20 to 0.0.0 over the time period. Since the 10 minute mark of the quarter, Richmond has controlled the football, leading the disposals 40 to 10 over the time period. Despite this, the Tigers have managed just 1.2.8 to 0.0.0 from this dominance. Despite kicking into a strong breeze, the Dockers have enjoyed all of the territory in the second quarter, leading inside 50s seven to two and enjoying 74 per cent time in forward half. Last season the Dockers averaged 13 centre bounce clearances per game, ranked eighth, and scored 10 points per game from this score source, also ranked eighth. Tonight they have four centre clearances, resulting in 2.0.12. While not amassing huge numbers, Fremantle's first draft pick from 2014, Lachie Weller had an effective first quarter amassing four disposals at 100 per cent efficiency, all won via a contested possession, kicking a goal and assisting another. Fremantle is controlling the football, leading uncontested possession 77 to 42 and marks 31 to 12. Richmond InterchangeTroy Chaplin replaces Ty Vickery due to the blood rule. Richmond InterchangeConnor Menadue replaces Jacob Townsend due to the blood rule. Cameron Sutcliffe leads the Dockers with 10 disposals, all of which have been effective and nine of which have come via an uncontested possession. Two out of Fremantle's three goals have been launched from its defensive 50. Last season the Dockers averaged 13 points per game from defensive 50 chains, ranked 12th in the competition. Hayden Ballantyne is bringing the pressure early in the game, laying four out of the 15 tackles recorded from both sides. No other player apart from Ballantyne has laid more than one tackle thus far. Troy Chaplin has started in an unfamiliar forward role for the Tigers and has kicked the Tigers' first score of the match, a behind. In 207 AFL games, Chaplin has kicked just the 14 goals. Both of Fremantle's goals have come as a result of intercepts. The Dockers scored 44 points per game from intercept possession chains last season, ranked 15th in the competition. The swirly conditions and the first game of the year for both sides has meant some scrappy skills early, the Dockers kicking at an efficiency of 42 per cent and the Tigers at 56 per cent. The Dockers are blooding just two players without senior AFL experienceDarcy Tucker and Sam Collins - the club's first and third selections in last year's 2015 National Draft. The Tigers are blooding nine players who have yet to taste senior AFL football, including all three playersDaniel Rioli, Oleg Markov and Nathan Broad - drafted by the club in the 2015 National Draft. The average age of the Fremantle side playing tonight is 26.2 years. Conversely, Richmond's average age for this evening is just 22.8 years of age. A HAMSTRING injury to Hayden Ballantyne has soured an otherwise impressive 60-point win by Fremantle over Richmond at Rushton Park in Mandurah. The Dockers' stars took control from the opening bounce to dispatch an inexperienced Tigers' side 0.14.6 (90) to 0.4.6 (30). Ballantyne's injury put a dampener on the performance. He limped off early in the second term and went straight to the rooms for treatment on his left hamstring. He took no further part in the match. Richmond lost Ty Vickery in the opening term to concussion. He had to be helped from the ground by a trainer and did not return. The Dockers looked sharp despite the Tigers' obvious inexperience. Lachie Neale (29 disposals) and Michael Barlow (27) dominated in the midfield, Michael Walters also pushed through the centre and was very damaging at times, while Tendai Mzungu was impressive floating forward and kicking two goals. Chatty Docker in hot water? 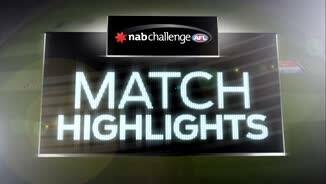 Matthew Pavlich, Matt Taberner and Jon Griffin provided a triple threat up front kicking eight goals between them, with Pavlich looking particularly sharp taking 10 marks and kicking flawlessly in front of goal. "We came here to build on our patterns of play with and without the ball and we thought we did that," Fremantle coach Ross Lyon said post-match. "We acknowledge it was against an inexperienced outfit but that certainly didn't interest us." Brownlow medallist Nat Fyfe sat out the first two quarters but took an outstanding mark and worked hard in the middle during the second half gathering 11 contested possessions, the equal most for the match. "I thought he worked into it pretty well," Lyon said. "He might play three-quarters next week or a full game. He was really keen to get out there and play." The Tigers had few winners on the ground. Shaun Grigg and Reece Conca worked hard in the middle. Kane Lambert gathered 17 touches while Oleg Markov and Mabior Chol showed some good signs throughout the match. Tigers' stand-in coach Brendon Lade was happy with the application of his young players. "Our guys battled pretty hard all day," Lade said. "Some of our kids today were very, very good, our first, second and third year players. Obviously the scoreboard didn't reflect exactly what we wanted but we're preparing for round one as best we can and we think this is our best preparation going towards that." 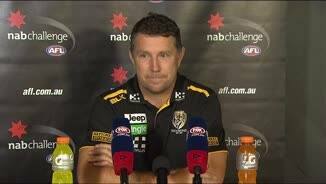 Lade said the Tigers would be close to full strength against Hawthorn next week. Fremantle: Michael Walters is going to add a lot of class and depth to the Dockers' midfield this season. He has been training there during the pre-season and started the game in the centre square where he was silky smooth with his ball use and decision-making. Lachie Weller looked sharp at half-forward which allowed Walters to push up the ground. Richmond: The experiment of using Troy Chaplin up forward is worth persisting with for the Tigers. He played most of the match up forward and fought a lone hand at times after Ty Vickery and Ben Griffiths spent large chunks of time on the bench due to head knocks. He kicked a goal and worked hard. The Tigers should stick with it. Fremantle: The Dockers' first pick in last year's draft Darcy Tucker looked impressive on debut for his new club. He gathered 21 touches and appeared composed with the ball. Sam Collins did not see that much game time but he did not look out of place. Richmond: Oleg Markov and Mabior Chol caught the eye. Sudanese born Chol kicked a goal in the last quarter and took three marks up forward, while Markov got plenty of the ball and used it well. Jacob Townsend was quiet with just 11 possessions. The Dockers head four hours south of Perth to the town of Mount Barker to face Adelaide. The Tigers head home to Victoria to face Hawthorn at Beaconsfield in a twilight fixture next Saturday.